Simple but effective, hacksaws are useful for a huge number of jobs - from cutting planks to size to sawing through metal bars. 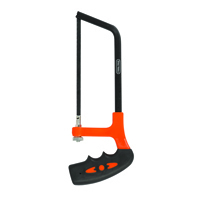 Add a quality hacksaw to your toolkit at a fantastic price from Euro Car Parts. Hacksaws are massively useful pieces of kit, making any cutting or sawing job a breeze with a minimum of effort. Unlike traditional crosscut saws, hacksaws include a C-shaped frame that keeps the blade stable under stress, making it easy to cut through even hard materials like metal. As well as cutting through lengths of pipe and metal bars, hacksaws are handy for sawing wood to a specific size, as well as cleanly and efficiently cutting through plastic. No toolbox is complete without a good quality hacksaw, and we’ve got a great selection of them available from well-known and trusted tool manufacturers. Browse our stock for quality tools of all types - we’ve got something for every job you can think of, all at low prices. Euro Car Parts stocks more than 130,000 different items, and in the unlikely event you can’t find what you need, just speak to our Special Orders team: they’ll be glad to track it down for you.